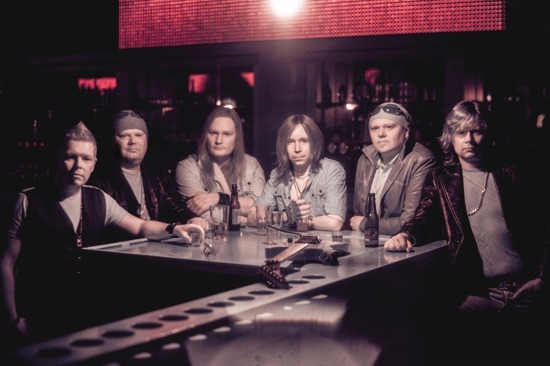 Finland’s Free Spirit made lots of fans in melodic rock circles with their debut album and as a massive fan Woody was keen to talk to front man Sami Alho about the new album. Sami, You released your last album ‘Pale Sister Of Light’ five years ago and have just released your latest album ‘All The Shades Of Darkened Light’, so what caused the long gap between albums? We started to work with ‘All the Shades of Darkened Light’ at the end of 2010. Until that we did promo with the debut album ‘Pale Sister of Light’ and released the record in different territories and formats like Rock Band 2 and 3 video games. In early 2011 we decided to concentrate fully on recording the new album. We were really excited with the new material and demos we had tracked earlier. When the actual recording process started, new ideas began to emerge one after another. Since we have our own studio facilities and the luxury to use them whenever we want, we made a similar decision as we did with the first album: We would take all the time we need to get the best possible result for the songs, and make sure that we'd be 100% satisfied with everything we've done. So, what happened during the recording process of ‘All the Shades of Darkened Light’ was quite similar to the ‘Pale Sister of Light’ sessions. Most of the instruments and vocal parts were recorded during the sessions between early 2011 and summer 2012. Some songs changed quite a lot during the process and it would be hard to recognize some of them from the original demos. Some songs were even in danger of being left out from the album, like the first single 'Living Tattoo,' but we decided to give them all a chance and so the track list of the album kept changing right up to the last moments. The recording sessions were finished in summer 2012 and the long editing, mixing and post production phase started. Some of the last overdubs were recorded in January 2013 and the final mix of the album was ready on February 17th 2013. Our original plan was to release the album fall 2013, but due to some favourable synergy issues, we decided to release two singles and then release ‘All the Shades of Darkened Light’ at the end of February 2014. Your debut album had a great eclectic feel to it mixing AOR and classic rock vibes which made a huge impression on rock fans, this time on ‘All The Shades’ there is a slightly stronger commercial radio friendly flavour to your songs, when writing the album was that intentional? Writing the songs for this album was more or less just following our instincts. All the positive feedback we got from ‘Pale Sister of Light’ gave us lots of self confidence and we wanted to continue from where we left with the first album and take a few leaps forward. We were aware of our strengths and we decided to concentrate on them. What we wanted was to get the sound bigger and get the energy of the band more present. All the members of the band love big melodies and huge chorus sounds and we wanted to make sure that we are 100% satisfied with all the melody lines and harmony layers. At first that was very time consuming, but once we found the sound we were looking for, it was more or less just steady hard work to sing all those backing vocal tracks and get all the necessary harmony parts in place. Now that you asked, it made me think that perhaps concentrating more on those streamlined melodies and improving the vocal sound made the whole album sound more radio friendly. Of course all the instruments were in an equally important role in creating the sound for this record. Our song writing has always been based on what inspires us at the moment, and we never have any certain end result in mind when we start writing a song. Or rather, we may have a certain idea on what a song should be like when we have those first ideas in our hands, but usually the song ends up being something very different than what we expected it to be. We have this saying that a song will tell us when it’s ready. Sometimes it feels almost like magic when you suddenly know that now the song is finished. Whatever new ideas you try to add after that certain point, nothing seems to fit in anymore and if you take something out, the song screams for it back. But to answer your question, the radio friendly sound wasn’t a specific goal that we would’ve aimed for during the writing process. One thing that makes you really stick out for me is your lyric writing, you stay away from the melodic rock clichés and cheesy lines, but you still manage to write heartfelt and relatable lyrics. Are lyrics important to you and the band’s sound? That comment really means a lot to me. Lyrics, and working with them with devotion, is very important to me for many different reasons. First of all it’s necessary that lyrics fit in to a melody and the sound of the words and the rhythm of syllables make the melody as dynamic as possible. It’s fun to play with these things and break the rhythm patterns deliberately. Sometimes it can create whole new nuances to melody lines. Equally important is that the lyrics deliver feelings and emotions to which the listener can relate to. The music and the instruments create the sound and “paint” a picture or scenery for the song, but the lyrics actually talk to people. Even if you don’t listen to the lyrics knowingly, they still define what the song is about and if a band or an artist is true to itself. It’s easy to forget or disregard that during the writing and recording processes, especially in a genre like this, which is full of strong expressions and skilled playing and singing. Don’t get me wrong, there is nothing wrong with clichés and cheesy lines. I like to use them occasionally also and some of them actually have a deeper meaning just because they’ve been used for so long and everybody knows them. Melodic rock is a very strong art form, but the power of the lyrics shouldn’t be underestimated. I believe that melodic rock with a bit sharper lyrics could widen the popularity of the genre quite a lot. Anyway, I’m very pleased to hear that you find Free Spirit lyrics heartfelt and relatable. I have tried my best and used lots of time trying to reach the level where the lyrics sound great, but also give the listener an emotional experience making the song more meaningful. Can you talk to us about a few of the tracks on the album, what they are about and any stories behind them? ‘All the Shades of Darkened light’ is not a concept album, but every song on the album is like a chapter in a book or a song in a musical or a movie. I had this one story in my mind where I placed the events and the characters of the album. For me, it's much easier to write lyrics when I have a bigger picture to look at. It also kind of directs the writing process because you know what part of the story is still missing and how much and what kind of music you still need to get story complete. The story itself is about a summer when high octane parties seems to go on forever, but the price to be paid can get way too expensive to some of the people involved. The opening track ‘Nights of Paradise’ is an up-tempo song that actually defines what this album is musically all about. Catchy guitar riffs with thick synthesizer stabs on top of groovy bass and banging drums with a huge vocal sound creating an adrenaline driven rock song. The song seems to open up the album just the way we hoped it would. ‘Nights of Paradise’ is actually the first track we recorded for the album. It started the whole process giving us the guidelines to what we wanted to sound like. ‘Living Tattoo’ and ‘Hysteria’ were the first two singles and they did the job they were expected to do, being an appetizer before the album release. It was hard to find what would be the appropriate track to follow ‘Nights of Paradise’ on the album because it seemed that none of those up tempo songs had a start that could compete with the opening track’s high emotional ending. Finally we realized that ‘Living Tattoo’ moves in a very different tempo and rhythm scale than ‘Nights of Paradise’, but it’s got a strong start in its own style, so it became song number two on the track list. For a long time it was obvious that ‘Hysteria’ would be single number two, and it’s release would be in sync with a Finnish werewolf movie ‘Anselmi, nuori ihmissusi.’ The video of the song is based on that movie and the song is also on the soundtrack of the film. I also play a role of a youth pastor in that movie and I’m the villain of the story. The famous American actor Ron Jeremy is also featured in the film. Yes, that Ron Jeremy. Some of the other songs have already gotten noticed by the audience, like ‘The Dew of the Rose’ which’s chorus melody line was originally found from our debut album sessions. ‘Burning Love’ has this keyboard riff that was discovered in a rehearsal session and that changed the drama of the song. ‘Turn on the Night’ is a song that every one of us loved to play in the studio. Perhaps because even if the song is a ballad, the key riff is played by the bass leaving all the other instruments float free and giving it at the same time a calm, but yet dangerous feeling. ‘Carry On’ is one of the key tracks on this album. We had many different versions of it. This version on the album is the simplest we could come up with and it worked the best for this song. My favourite part is that juicy guitar lick at the end of the song and that arena choir which takes the song to its finale. It’s a great part to sing together with the audience when we’re live on stage. ‘Silence’ moves in many different levels both musically and lyrically. The song has an important role in this album, because it’s the most minimalistic track we did. Perhaps because of that, it has the biggest sound we managed to create. 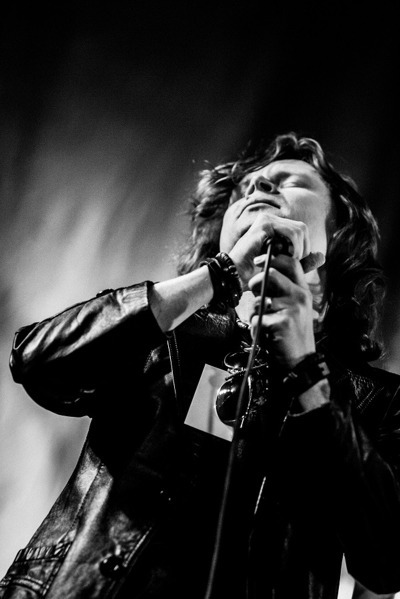 ‘Fever’ is also mentioned a lot and it’s one of those adrenaline driven songs that we love to play live. ‘Fever’ is the next song on video, so be ready for it. It would be fun to talk about all of the songs on the album and the processes they’ve been through. I hope together these songs can create an entity, but I also hope that they have a role as independent pieces of work. Do you have any live dates planned? And most importantly is there any chance of seeing you in the UK? People are working with them at the moment and hopefully within near future, we can announce live dates. UK is also a part of these plans and I can tell you it would be a dream come true for all of us to tour in the UK. We have had few gigs here in Finland with this new material and these songs seem to work great on stage in front of a live audience. I think this time we have much better chances to tour with this new album, because it seems that people haven’t forgotten Free Spirit, if any conclusions can be drawn from the acceptance these new songs have had. I hope that during the coming months we will have a chance to meet and have a good time with the audience and build our reputation also as a live band. I know all musicians are different in what they enjoy most in the music biz, but is playing live important to you or do you prefer the creative and recording side of music? That’s a really a tough question. These things have lots in common, but they’re almost like two whole different ball games. I had great time writing and recording this album, even if the whole process took much longer than anyone expected. Now it’s easy to be happy about all the time we spent in the studio, because the audience seems to be really happy with the end result. As long as we can maintain the joy of making new music as a band, the creative and recording side of music will be in a key role in Free Spirit’s future and an inseparable part of our personalities. On the other hand nothing can take away that uplifting feeling when you are on stage interacting with the live audience, your songs as a medium. Perhaps every artist or band has this natural urge to perform and that is also one thing you just can’t take away from your personality. Let me put it this way: the creative and recording side of music is important to me, because it gives me a chance to get on the stage and enjoy, together with the audience and my band mates, the work I’ve created with my best friends in the studio. There are quite a few bands from Finland who I really enjoy, and it seems to be a country where rock bands are not afraid to have strong melodies and pop edges to their music, Reckless Love have a good fan base in the UK and I Love Brother Firetribe. From an outside perspective it seems like Rock and Metal in general has a strong presence in Finland, how do you see the rock scene in your homeland? Finland is not a promised land only for rock and metal anymore. Nowadays all kinds of forms of making music have become more and more acceptable and we do have a rich culture in rock and pop music at the moment. One of the most popular artists in Finland right now is a reggae artist who sings in Finnish. Can you imagine that! On the other hand our home market is quite small and competition gets tighter day by day. The music industry in Finland is more interested in artists who sing in Finnish. Those artists whose lyrics are in English more or less have to find their audiences outside of Finland. The trend nowadays is that here there are many bands that are not very well known in Finland, but might be huge in somewhere else. To give you an example, a pop rock group called Sunrise Avenue is huge in Germany, but radios hardly play their music in Finland and the band doesn’t tour in Finland basically at all. Perhaps the situation on our domestic markets, and on the other hand encouraging examples of success from abroad, has made bands try a more pop and melodic oriented approach to their music to appeal to wider audiences. High quality musicianship has always been related to our strong tradition of heavy metal and if you mix that with catchy pop edge melodies it can be a killer combination. You had a really positive reaction to your debut album and it looks like ‘All The Shades of Darkened Light’ is going to cement you a reputation as a well loved band, so will we have to wait another five years for album three? I really hope that with this new album we can create a network of solid partners in as many territories as possible. If we manage to do that and establish the bands reputation as a recording and live artist, I’m sure we will have more time to concentrate on song writing and recording the new album as a full time job, which will speed things up dramatically. Is there anything else you’d like to add or say to Rocktopia readers? Thank you for your support and patience people! We really hope to get on the road soon and see you all there. Meanwhile, enjoy the new album ‘All the Shades of Darkened Light’ and be ready for the new videos that are coming soon. Peace, love and rock ‘n’ roll!